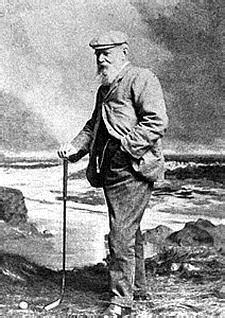 Old Tom Morris (or Tom Morris Senior) lived from 16 June 1821 to 24 May 1908. Although golf had been played in Scotland for centuries before his day, Old Tom Morris is rightly viewed as the father of the game as it is now played in every part of the world. Morris was born in St Andrews. After leaving school in 1837 he spent 12 years working there as an apprentice to Allan Robertson, generally recognized as the world's first professional golfer. There he learned to make golf clubs, and how to produce the feather-stuffed balls then in use. The two also played golf together, achieving a reputation for being unbeatable as a pair. With the arrival of gutta percha balls, Robertson saw his business threatened, and demanded Morris join him in condemning the new balls. Instead, Morris left St Andrews, taking up a position as "keeper of the greens" at the newly formed Prestwick Golf Club. During this time he did much to develop the art and science of green-keeping, introduced the idea of top-dressing greens; he was also among the first to actively manage the hazards on a golf course; and he was the man whose influence eventually led to the standardization of the length of a golf course at 18 holes (the Old Course at St Andrews had at one time comprised 23 holes). 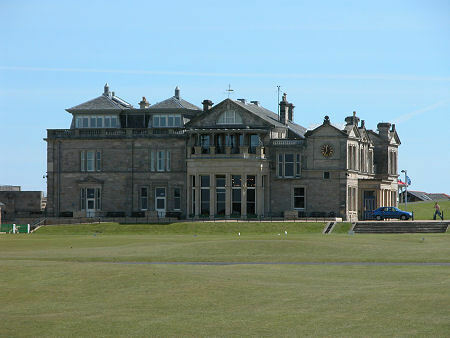 In 1860, Prestwick hosted the first Open Golf Championship. Old Tom Morris came second to Willie Park, though he went on to win the Championship four times over the following decade. He was described as having a slow, smooth swing and being fiercely competitive; his only flaw was a difficulty with short putts. In 1865 Morris returned to St Andrews to take up the position of greenkeeper at the Royal and Ancient Golf Club, and he established a clubmaking shop overlooking the 18th green on the Old Course, a hole that is now named after him. He also became the first of the great golf course designers, producing or redesigning some 75 golf courses. These include Prestwick, Royal Dornoch, Muirfield, Carnoustie, Cruden Bay and, only recently rediscovered, Askernish Golf Club in South Uist. As a player, Old Tom Morris still holds two records in the Open Championship: the oldest winner at 46 in 1867, and the largest winning margin by a winner, by 13 strokes in 1862. And with his son, Young Tom Morris, he holds the record as being part of the only father/son pair to finish as winner and runner up, in 1869. Young Tom Morris was also to win the Open Championship four times, but died tragically young, aged 24, on Christmas Day 1875 a few months after the death of his wife during childbirth. Old Tom Morris played in every Open Championship until 1895, when he was 74. When he died, in 1908, he was 87, and it is said that his funeral procession extended the entire length of South Street in St Andrews, from the port to the cathedral. Memorials to him include the name of a road in St Andrews and a larger-than-life statue in the British Golf Museum in St Andrews. And in the form of just about every golf course in the world; and the way the very game of golf itself has been played as a result of his influence.